Once associated with hippies, hemp is sustainable and useful crop that packed with essential fatty acids, including Omega 6 and 3. These fatty acids help improve, treat and prevent a series of illnesses and ailments, such as diabetes, vision problems, depression, ADHD, heart and lung diseases and asthma, to name a few. They also promote skin health, improving hydration, flakiness, redness and eczema. As a fibre, hemp is natural, hardy and easy to grow. It’s used in clothing and accessories thanks to its sustainability, durability, ease to dye and bleach without the need for harsh chemicals. Once turned into a fabric, hemp is soft, versatile and long-lasting. Hempseed oil is a brilliant ingredient in skincare and food, so why not wear, eat and apply hemp? Here are a selection of products on the market that utilise hemp. Give them a try, you won’t be disappointed! Legendary natural brand Dr Bronner uses hempseed oil in many of its products. Its Pure-Castile-Soap (liquid and in a bar) is packed with it and you can use it on your skin, to wash your hair, clothing and even to clean around the house. For soft skin, try Dr Bronner’s Organic Lotion, which can be used on face, hands and body. Beauty brand Hempz uses hempseed oil in everything, from moisturisers to haircare, lip balms to sunless tanning lotions. If you are after softness, this brand is for you. Natural and organic brand Green People’s Fruitful Nights Night Cream is brilliant on dry, ageing and flaky skin and particularly suitable in dry or cold weather. 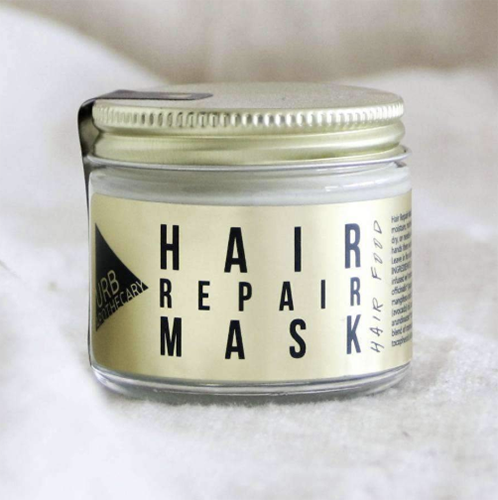 This mask will soften and smooth dry, frizzy hair, prevent breakage, add shine, treat itchy scalps and it even comes in a recyclable glass jar with aluminium lid. Ditch (=recycle) your plastic makeup bag and store your toiletries in this instead. It’s lightweight, pretty, and can be washed as often as needed. Hemp has so many uses, you can even make eyewear frames out of it! Glasses and sunglasses are mostly made of plastic, but Hemp Eyewear have challenged this by making a gorgeous line of eye accessories using hemp. As sustainable as they are cool. Swap cotton for hemp. This pretty dress is made by 100% hemp, which is not only a sustainable fabric, but also beautifully soft and breathable. Adding hemp to your diet couldn’t be easier or more delicious. The Primal Pantry offers a selection of vegan hemp-packed protein bars in four delicious flavours (Mixed Berry, Cocoa Brownie, Cocoa Orange and Double Espresso). Perfect for breakfast and as a snack. Munchy Seeds do a variety of seed pots and sachets that can be eaten as as a snack or added to dishes. Their Omega Sprinkles include many omega 3 packed seeds, including hemp. Eat on their own or add to salads, smoothies, bread, soups, vegan roasts and more. This delicious oil has a delicate herby, nutty flavour that works well in a variety of dishes, such as salads, pasta, raw and roasted vegetables, bread and much much more.